The following is a brief list of related verdicts and settlements which the law office of SS&F has obtained on behalf of their clients. Suffering from a back or neck injury, please see our “back and neck injury” page for advice. 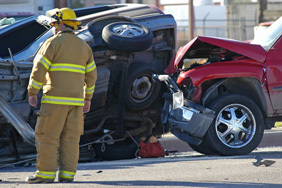 39 year old man suffered a back injury in a t-bone car crash, caused by an inexperienced driver. The crash resulted in an L4-5 fusion surgery for our client. While initially unable to work, he has returned to a meaningful life with his family and career. 51 year old pedestrian, struck on Mission St. in Santa Cruz, Ca, by a commercial vehicle. The man suffered a C5-6 neck surgery. There were significant issues about whether the pedestrian was in or out of the crosswalk, and whether the driver could see the pedestrian in the early morning light, when the collision occurred.